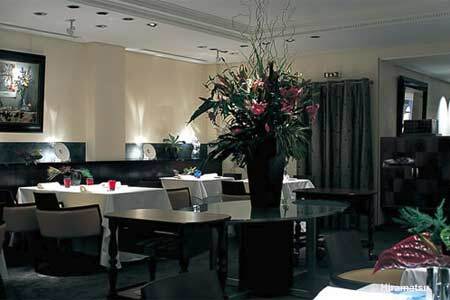 The Paris-located crown in the Japan-based Hiramatsu group of cafés and restaurants. Exceptional French cuisine and an amazing wine collection. Lunch & Dinner Mon.-Fri. Closed 1 wk. in Feb,. 2 wks in Aug.
: In Japan, Hiramatsu runs some ten high-end French cuisine cafés and restaurants. In France, Hiramatsu acquired his space from Guy Faugeron, who has retired. Even if Hiramatsu in Paris is the showcase of the group and training ground for young chefs headed back to Japan after a year or two immersed in French cuisine, the food is exceptional here. It is a light, delicate and transparent cuisine; a food whose tastes are underlined with the simple juices emanating from its preparation, aromas expressed by their contrast, and cooking respectful of textures. On the spring menu, the lobster arrives in a rich stew; but you'll have to wait until autumn for the dazzling young pigeon roasted in a honey and red wine sauce and its own liver. Hideya Ishizuka, former sommelier of the Château de Cordeillan-Bages in Pauillac, has composed an astonishing cellar.